George Martin, the producer who guided the Beatles to astounding heights, has died, his manager says. He was 90. The Beatles were a miracle not only of talent, but of chemistry. No producer was better suited for them than the resourceful and open-minded Sir George Martin, who dedicated himself to serving their vision instead of imposing his own. And no act Martin worked with before or after approached the Beatles' historic power. Martin, the elegant Londoner behind the band's swift transformation from rowdy club act to musical and cultural revolutionaries, was remembered Wednesday with tributes to his rarely erring taste, his musicianship and his contribution to developing the technology of pop music. "If anyone earned the title of the fifth Beatle it was George," Paul McCartney said Wednesday following the announcement of Martin's death at age 90. Many felt he deserved the title, but he was too modest to claim it while producing some of the most beloved songs and most popular and influential albums of modern times — "Sgt. Pepper's Lonely Hearts Club Band," ''Revolver," ''Rubber Soul," ''Abbey Road" — elevating rock LPs from ways to cash in on hit singles to art forms, "concepts." From a raw first album in 1962 that took a day to make, to the months-long production of "Sgt. Pepper" just five years later, Martin would preside, assist and sometimes stand aside as the Beatles advanced by giant steps as songwriters and sonic explorers. They composed dozens of classics, from "She Loves You" to "Hey Jude," and turned the studio into a wonderland of backward tape loops, multi-tracking, unpredictable tempos, unfathomable segues and kaleidoscopic montages. Never again would rock music be defined by two-minute love songs or guitar-bass-drums arrangements. "Once we got beyond the bubblegum stage, the early recordings, and they wanted to do something more adventurous, they were saying, 'What can you give us?'" Martin told The Associated Press in 2002. "And I said, 'I can give you anything you like.'" His own talents were duly recognized. 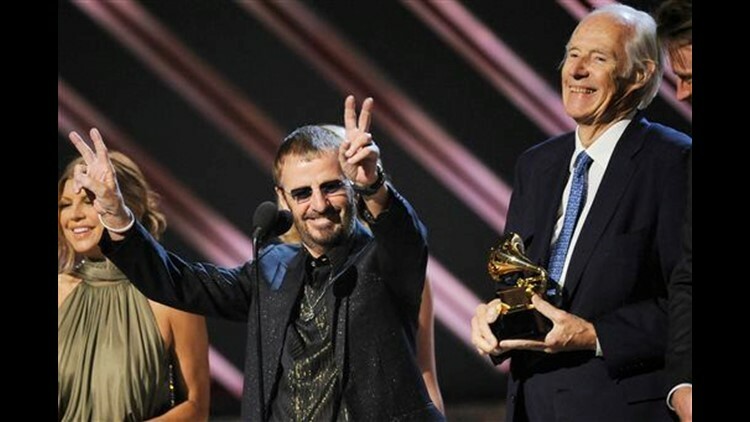 He was nominated for an Academy Award for producing the soundtrack to the Beatles' "A Hard Day's Night." He won six Grammys, and was inducted into the Rock and Roll Hall of Fame, in 1999. Three years earlier, he was knighted. Besides the Beatles, Martin worked with Jeff Beck, Elton John, Celine Dion and on several solo albums by Paul McCartney. In the 1960s, Martin produced hits by Cilla Black, Gerry and the Pacemakers, and Billy J. Kramer and the Dakotas and for a 37-week stretch in 1963 one or another of his recordings topped the British charts. But his legacy was defined by the Beatles, for the contributions he made, and for those he didn't. Before the Beatles, producers such as Phil Spector and Berry Gordy controlled the recording process, choosing the arrangements and musicians; picking, and sometimes writing the songs (or claiming credit for them). The Beatles, led by the songwriting team of McCartney and John Lennon, became their own bosses and were among the first rock groups to compose their own material. Inspired by native genius, a world's tour of musical influences and all the latest stimulants, they were seekers of magic who demanded new sounds. Martin was endlessly called on to perform the impossible, and often succeeded, splicing recordings at different speeds for "Strawberry Fields Forever," or, for "Being for the Benefit of Mr. Kite," simulating a calliope with keyboards, harmonica and a harmonium that the producer himself played with such intensity he passed out on the floor. Martin would have several good turns on the keyboards, performing a lively music hall solo on McCartney's "Lovely Rita" and a Baroque reverie (at studio-heightened speed) on Lennon's "In My Life." His bearing was infinitely more patrician than the Beatles', but he grew up working class. Born in north London in 1926, Martin was a carpenter's son raised in a three-room flat without a kitchen, bathroom or electricity. He was a gifted musician who mastered Chopin by ear, a born experimenter enchanted whenever he discovered a new chord. In demand as a producer long before he met the Beatles, he was a graduate of the Guildhall School of Music, studying composition and orchestration and performance on the oboe and piano. (His oboe teacher was the mother of actress Jane Asher, McCartney's future girlfriend, and of the singer and producer Peter Asher). "Music was pretty well my whole life," Martin wrote in his memoir, "All You Need is Ears," published in 1980. Hired by the EMI division Parlophone Records in 1950, Martin initially worked on classical recordings with the London Baroque Ensemble. The technology was primitive, with recording on wax cylinders with machines which weren't driven by electricity, but by weights. Named head of Parlophone in 1955, he also worked with Judy Garland, jazz stars Stan Getz, Cleo Laine and John Dankworth, and with Peter Sellers and Spike Milligan of the "Goon Show," an absurdist comedy troupe much loved by the Beatles. By the early '60s, Parlophone was fading and Martin was anxious to break into the pop market. His prayers would be answered beyond all reasonable expectations when a Liverpool shopkeeper and music manager, Brian Epstein, insisted that he give a local act, the Beatles, a listen. The Beatles already had been turned down by Decca Records and told that "guitar groups are on the way out." Martin was also unimpressed by their music, but, to his eternal fortune, was pushed into taking them on by EMI executive L.G. Wood. He was more than a decade older than the members of the Beatles and regarded them as a parent might look upon his mischievous, but charming children. Martin was at first very much in charge, choosing "Love Me Do" as their debut single and confining the newly-hired Ringo Starr to tambourine (a slight the drummer never quite got over). But during a time when the young were displacing the old, Martin would find his own role upstaged. On the first day in the studio, Martin lectured the Beatles on their weaknesses, then asked if there was anything they didn't like. First of all, George Harrison reportedly replied. "I don't like your tie." The backtalk was also professional. After the Beatles had a modest hit with "Love Me Do," Martin recommended they follow with a light pop track, "How Do You Do It." To Martin's surprise, the Beatles insisted on Lennon-McCartney's "Please, Please Me," originally written as a slow, Roy Orbison-styled lament. Martin's response typified his perceptive and flexible approach. He agreed to the song, with one condition — they speed it up. The result was a rush of harmony and rhythm, their first smash and the beginning of a phenomenon soon dubbed "Beatlemania." "Gentlemen," Martin informed the band after "Please, Please Me" had been recorded, "you have just made your first number one record." The Beatles seemed to reinvent themselves with each album, and sometimes each song. The single "I Feel Fine" was among the first records to include guitar feedback, while Harrison's sitar on Lennon's "Norwegian Wood" introduced millions of listeners to Eastern sounds. Their lyrics, especially Lennon's, became more personal and sophisticated, and sometimes surreal. The Beatles, none of whom could read music, depended on Martin's classical background. They might hum a melody to the producer, who would translate it into a written score, as he did for a trumpet solo on McCartney's "Penny Lane." For McCartney's "Yesterday," Martin convinced the composer that a bluesy string quartet would serve the song's tender remorse. Martin initially didn't share in the Beatles' massive wealth, drawing a staff salary from EMI. But in 1965, he left to help form an independent company, Associated Independent Recordings. The Beatles agreed to keep working with him, on a freelance basis, leading Martin to boast that "I suppose I am now earning more than the managing director of EMI records." He was otherwise unaffected by the revolutionary changes around him, and his naivety led to some comical moments in the studio, like the night that Lennon, high on LSD, complained of feeling ill. An unsuspecting Martin ordered Lennon brought up to the roof, a dangerous place for an acid head. The Beatles began to break apart after "Sgt. Pepper," released in 1967, and Martin's contributions would also peak. Responding to The Band and other American groups, the Beatles turned against their own studio tricks and preached a more basic sound. Their double "White" album was far sparer and individual Beatles essentially served as producers for their own songs. The album's length was also a rebuke against Martin; he had urged them to put out a single record, saying there wasn't enough good material for two. For "Let It Be," a self-conscious effort to reclaim their early sound, they displaced Martin altogether, turning over the tapes to Spector. After "Let It Be," an unhappy process for all involved, Martin assumed he was done with the Beatles. But they asked him back for "Abbey Road," released in the fall of 1969, and their final, slickest record, capped by an extended suite of song fragments. The band split the following year. Artistically, Martin would never approach such heights again. But he did manage commercial success with the pop groups America and the Little River Band and produced two top James Bond themes — Shirley Bassey's "Goldfinger" and McCartney's "Live and Let Die." Martin intended for the production and scoring of Elton John's "Candle In The Wind '97," a tribute to the late Princess Diana, to be his last project. But in 2000 he produced "1," a multimillion-selling compilation of Beatles' No. 1 songs, then followed with a six-CD retrospective of his recording career. Martin was married twice, and had four children." In his later years, Martin — with his fine white hair and beautifully tailored clothes — was a treasured figure on Britain's music scene. He played a prominent role at Queen Elizabeth II's Golden Jubilee concerts in 2002, leading a cheer of "hip hip hooray" in her honor, and was sometimes seen at Royal Festival Hall when Brian Wilson performed. His career did exact a price — Martin's hearing was badly damaged — and left him with a few regrets. He wished he had paid more attention to Harrison's songs, but acknowledged that Lennon-McCartney was an impossible act to top. And he learned that the Beatles, no matter how irresistible, worked best in their native tongue. In Martin's memoir, he recalled demanding that the boys record a pair of hits, "She Loves You" and "I Want to Hold Your Hand," in German, appealing to a country where the group had performed often in its early years. The Beatles were enraged, and refused even to show up for the session. The usually patient producer hurried over to their hotel, stormed into their room and chewed them out as band members fled and then repented. "One by one, Beatle faces appeared from Beatle hiding-places, looking like naughty school boys, with sheepish smiles," Martin wrote. And so they came to the studio the next day and taped "Sie liebt dich" and "Komm, gib mir deine Hand," which proved no catchier than their titles. "But of course they were right," Martin wrote. "Beatles records, in English, were to sell in millions in every country, Germany included. Never again did they make a record in a foreign language."